Unique design is ideal for highly dynamic applications. The TKR 0200 is extremely low-noise and low-vibration. The "polygon effect" is minimized. The TKR 0200 cable carrier system is suitable for a wide number of applications. Optimum uses are especially handling and installation systems, robots, meters, automatic pick and place systems, printing and textile machines. Due to their low noise during operation, TKR 0200 type cable tracks are optimally suitable for applications with low-vibration linear drives. Suitable for clean rooms and extremely long service life. The movable joining elements are injection molded onto the chain links and additionally increase the service life of the system. Suitable for clean rooms with abrasion-resistant joining elements. Divider system with continuous height subdivision. 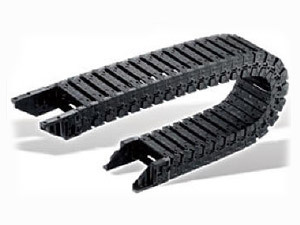 Ideal for unsupported applications on their side, and those with high transverse acceleration. Can be opened inside and outside in a single manual operation. Extremely low-noise and low-vibration operation. Tight pitch - almost no polygon effect. The chain elements are connected by flexible joining elements. The low-noise construction of the chain bands and the small pitch ensure extremely quiet and low-vibration operation. The modular design makes it easy to shorten and lengthen. Variable connectors for fast installation. The inner and outer connection variants can be easily changed later at the driver and fixed point by rotating the connecting pieces.